On by default. Can be forced off through video driver. 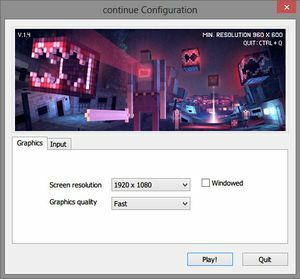 Graphics quality setting only has "Fast" option. There is no in-game menu. 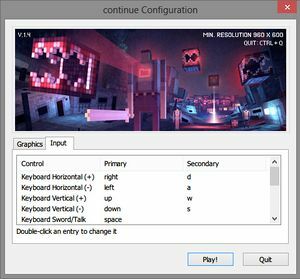 On some configurations game controls do not work properly, the player continually moves up and left and eventually gets stuck. Configuration utility is not available on Linux. Therefore, pre-selected windowed option cannot be unchecked. Right-click on the game in your Steam library and select Properties. Select Set Launch Options and enter: -screen-width SCREEN_WIDTH -screen-height SCREEN_HEIGHT. Alt+F11 shortcut might not work on Linux systems without Xfce. The game does not start on some Linux systems. One of the users reported that updating to the latest graphics driver solved the issue.